As increasing investment spent in social infrastructure construction, Our government make the great decision to rebuild high speed road and railway especially demolition village in the city. There is great implementation and development in urbanizationproject , so that mobile crushing plant and stone crushers are in great demanded. Great Wall Company forecast the brilliant prospect of jaw crusher plant for metallurgy,chemical,coal and electricity in the near future. What are technical features of portable jaw crusher plant? It can process construction waste in the spot and greatly save the transportation fees.Jaw crusher plant has been installed with optimized configuration , which includes jaw crusher, vibrating feeder,belt conveyor and vibrating screen etc., Jaw crusher plant is complete crushing and screening plant. Big crushing ratio and good product granularity widely used in the construction and mining industries. Jaw crusher plant has been one of the most important stone crushers in crushing plant . Previous: How to correctly operate impact crusher in stone crushing plant? 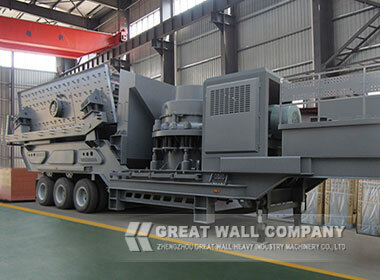 Next: What are technical features of Great Wall stone crushing plant ?